Mesa is growing by leaps and bounds and much of that growth is in southeast Mesa. Sleepy Mesa-Gateway airport is taking off (see what I did…airport/take off). The expectation is that Mesa- Gateway will exceed Sky harbor’s capacity in the next 7 years. Time will fly. There will be a growing demand for more nearby amenities. This will bring jobs to Mesa! 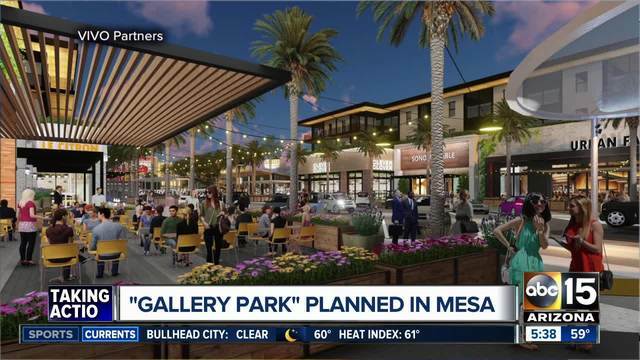 Plans are underway to build “Gallery Park”, a lifestyle destination that will sit on 40 acres southeast of the Loop 202 and Power Road, near the Phoenix-Mesa Gateway Airport. The development will have approximately 400,000 square feet of office space, two hotels, 420 luxury apartments and condos along with restaurants, retail space, and a movie theater. Jose Pombo, with the developer VIVO Partners, said they estimate about 2,000 new jobs on site between the shops and restaurants. When complete, there will be approximately 400,000 square feet of office space, 420 luxury apartments and condos, and two hotels. Construction is expected to start Spring of 2019. The first phase of the project is expected to be completed in 2020. This will be the first of its kind in this area with a mix of tenants, restaurants, social events, and shops. This is something the area has been craving. It will showcase an eclectic art-walk experience with wall murals, exterior fixed and interactive art installations, and revolving art displays featuring emerging local artists. Gallery Park will also require each office building and hotel to display art within their entry lobbies, Restaurants will be strongly encouraged to participate by displaying artwork compatible with their unique identities. This will be a truly one-of-a-kind place in the Mesa area. Location is always key for projects like this and the Mesa Gateway is ideal. Access will be easy from Loop 202 and it will be within a 5-mile radius of more than 225,000 consumers and a 10-mile radius of nearly 1 million people. It’s just minutes from the Phoenix-Mesa Gateway Airport and the Arizona State University Campus. Stay tuned for more information on this new project.